John Joseph Wallace, Jr. passed away at the age of 88 on Tuesday, December 2, 2008. A lifelong resident of Birmingham, Mr. Wallace was a longtime member of both St. Catherine and St. Patrick parishes. He was a charter member of St. Patrick Knights of Columbus Council 10567, making his First Degree on March 3, 1991. He became a Second Degree Knight and then third Degree on April 7, 1991. Mr. Wallace was born January 31, 1920 in Jefferson County to the late John Joseph Wallace, Sr. and Viola Lambert Wallace. He was a retired locomotive engineer and War World II Marine veteran, having served in the South Pacific. He was very active in other church and community organizations and services throughout the years. 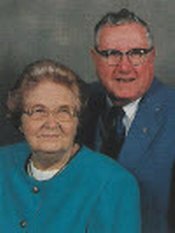 In addition to his parents, he was preceded in death by his loving wife of 66 years, Mabel Rose Powers and his son, Joseph Patrick Wallace. He was survived by his daughter, Linda and Carl Champion of Douglasville, Georgia: son, Larry and Treb Wallace of Camden, Alabama and daughter-in-law, Jean Mayhall Wallace of Haleyville, Alabama: 8 grandchildren, 12 great grand children, 2 sisters-in-law, several nieces and nephews. Mr. Wallace's funeral was held on Friday, December 5, 2008 and he is buried in Elmwood Cemetery. Editor's Note: We welcome any contributions to this page from any friends or family of our brother Knight Joe Wallace. If you were one of the many who celebrated the life of Mr. Wallace and you have any comments or stories about Joe that you would like to share, please e-mail Louis J. Muro. We also welcome any photos of Joe that you might have. To send an e-mail to Mr. Muro to submit comments, click here to go directly to his contact page.